I had a sudden urge to try something I’ve never baked before: a soufflé! I don’t know where the urge came from – it might have been Daniel Boulud’s great-sounding passion fruit soufflé recipe – or perhaps it was the fact that the wonderful Italian store in Chelsea market sells fruit purees that I have been looking for an excuse to try. In any event – I undertook what seemed like an ambitious task to bake a soufflé but it turned out to be rather easy. I had a perfectly tall soufflé out of the oven and then the real challenge – getting a photograph I liked before it was completely deflated. I had thought I might have 5 minutes or more to complete the task but I only had a few minutes – and the walk from my oven to the studio consumed at least one of those. Flicking through the images on my computer was almost like watching a flip book movie of soufflé deflation: going, going, going gone! The funny thing is that the very same week I tried this and posted the results to my flickr food photography group, two others also made soufflés and we had fun comparing results and sharing tips for how to get a good photography. Certainly, baking the soufflés in rounds so I had a number of fresh ones to work with was helpful. I am sure that there are many other tricks to employ. The soufflé discussions also lead me to an article that Helen of Tartelette wrote on soufflés for Desserts Magazine (click here and then see the article that begins on p. 104). Look how gorgeous and tantalizing her photos are! Wouldn't you like to know her mom’s recipe for cheese soufflé? 1. Melt the butter in a large skillet over medium-high heat. Add the sugar, a few tablespoons at a time, stirring after each addition, until it melts. Continue to cook until the sugar syrup turns a light golden brown. 2. Add the pear and continue to cook, while stirring, until the pears are tender and nicely caramelized, about 10 minutes. Stir in the passion fruit purée and heat for a minute or two. Remove from the heat and keep warm while preparing the soufflés. 3. Center a rack in the oven and preheat the oven to 375°F. Generously butter the inside and rims of four 6-ounce soufflé dishes. Dust the insides and rims with sugar, making certain that they are thoroughly coated. Tap out the excess sugar and put the dishes on a baking sheet. 4. 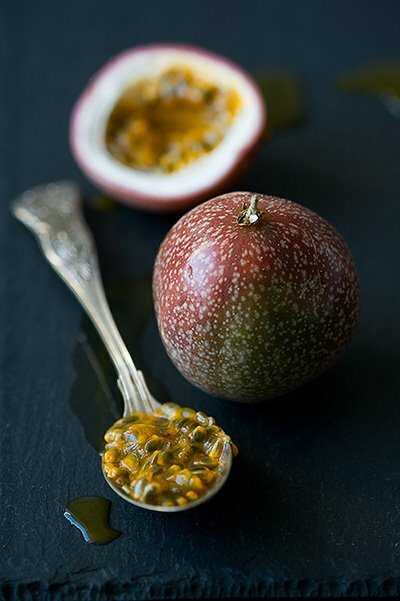 Whisk together the egg yolks and passion fruit purée in a large bowl until well blended; set aside. 5. Put the egg whites in the bowl of a mixer fitted with the whisk attachment. Beat on medium-low speed just until foamy. Increase the speed to medium-high and gradually add the sugar, beating until the whites form glossy medium-stiff peaks. Using a large rubber spatula and a light touch, fold the meringue into the yolk mixture in three additions until well incorporated but not overmixed. 6. Fit a pastry bag with a large plain round tip and fill with the soufflé mixture. Pipe (or if you prefer spoon) the mixture into the dishes up to their rims. Run your thumb along the outside edge of the dishes to remove any excess butter and sugar. Bake the soufflés for 15 to 20 minutes, until puffed and lightly golden. If you touch the tops of the soufflés, they should be firm with centers that are still a bit jiggly. 7. Meanwhile, transfer the sauce to a warm sauceboat; keep warm. 8. When the soufflés are done, carefully pull the baking sheet from the oven. 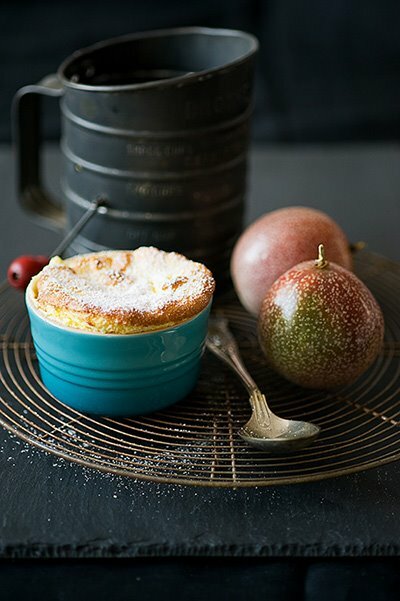 Dust the tops of the soufflés with confectioners' sugar and serve immediately with the pear-passion sauce. 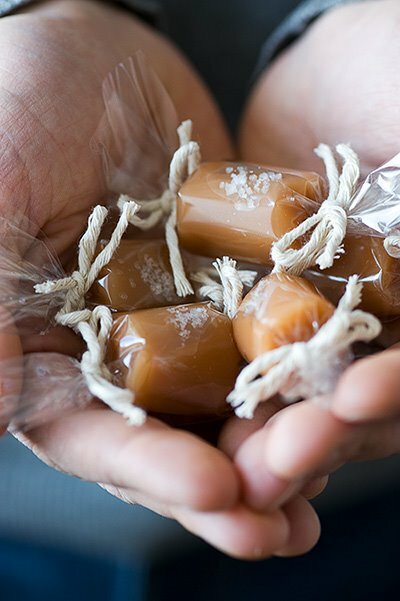 I was a bit wary as I’d never made caramels before but they were quite simple and quick. I followed Ina’s recipe to a “t” until I got to the very last step: forming the individual caramels. I’ve adjusted the recipe below to reflect my changes. p.s. A couple of photography notes: my photo of homemade cinnamon buns won the "aesthetics" award in last month's DMBLGIT - thanks so much Zorra and judges! Lou Manna is having a photo contest to help find inspiration for the cover of his next book. Read more about it here. 1. Line the bottom of an 8-inch-square baking pan with parchment paper, then brush the paper lightly with oil, allowing the paper to drape over two sides. 2. In a deep saucepan (89 diameter by 4 1/2" deep), stir together 1/4 cup water with the sugar and corn syrup and bring them to a boil over medium-high heat. Continue to boil until the mixture is a warm golden brown color. Don't stir — just swirl the pan to mix. Watch carefully, as it will burn quickly at the end! 4. When the sugar mixture is a warm golden color, turn off the heat and slowly add the cream mixture to the sugar mixture. Be careful! It will bubble up violently. Stir in the vanilla with a wooden spoon and cook over medium-low heat for about 10 minutes, until the mixture reaches 248°F (firm ball) on a candy thermometer. Very carefully (because it's hot!) pour the caramel into the prepared pan and refrigerate until firm. 5. 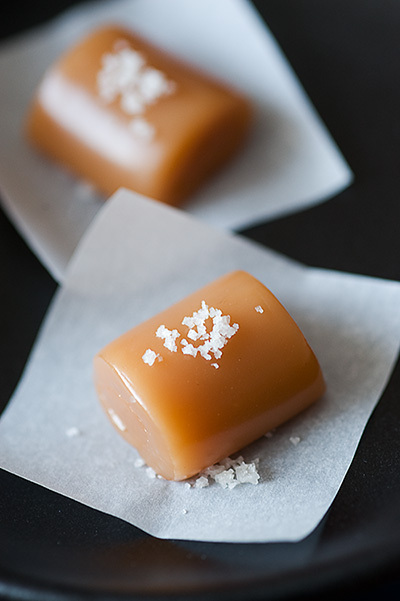 When the caramels are cold, use the parchment paper to pry the sheet from the pan onto a cutting board (note: the caramels will still be supple and easy to handle – if too stiff, allow to sit at room temperature for 10 minutes). Using the parchment and starting from the long side, tightly roll the caramel up until you have rolled 1/3 of it. Cut along the edge and repeat two more times. Use the parchment to gently roll each log to even out the thickness and smooth out the seam from the cut side. Cut each roll into 8-10 pieces, taking care not to touch the caramel with your finger. Sprinkle each piece with fleur de sel and wrap individually in glassine or parchment paper. Store in the refrigerator and serve the caramels chilled.